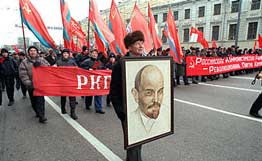 MOSCOW, April 22 About 2,000 people gathered at Vladimir Lenin's mausoleum Sunday morning to mark the anniversary of the Bolshevik leader's birth. Just look at the poor sap holding Lenin's picture. So brainwashed. Trev's got a snap of Rodney in his wallet. Sleeps with it under his pillow and wears PJ's with the Seven Dwarfs on them.